On being strange: "Look, I don't think that I'm strange, but I know I'm definitely strange," Pharrell Williams says, crunching a Dorito and considering how others may view the method to his creative madness. "My process works for me, and it may seem a little . . . I don't know. I mean, I do weirdo sh*t like watch Huckleberry Hound at two in the morning eating Corn Pops, you know what I'm saying?" Hans Zimmer on Pharrell: "It's the experimentation part that I love about him. I was supposed to help Pharrell on Despicable Me, and all I tried to do was stay out of the way of the onslaught of creativity that was coming from him. 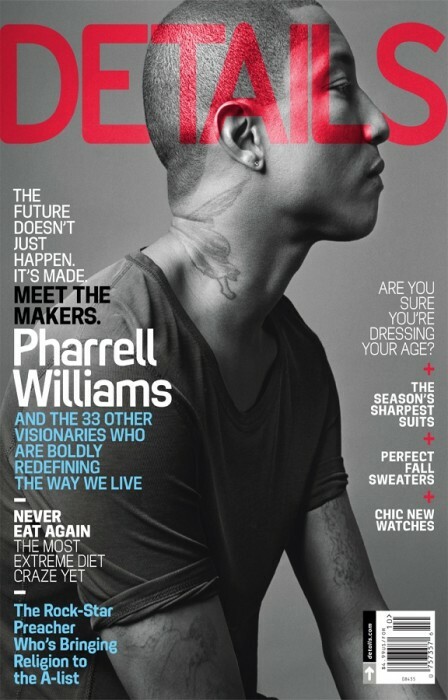 Because it's Pharrell, you don't just limit him to music. There's the fashion thing, the art thing—there's all these other things. All these polymorphic qualities make it really interesting. That's why I love Pharrell, because, yes, we will touch on music, but then I've heard him talk on human rights, I've heard him talk on artists and their role in the world. Everything is informed by everything else, and that's why his music's good." 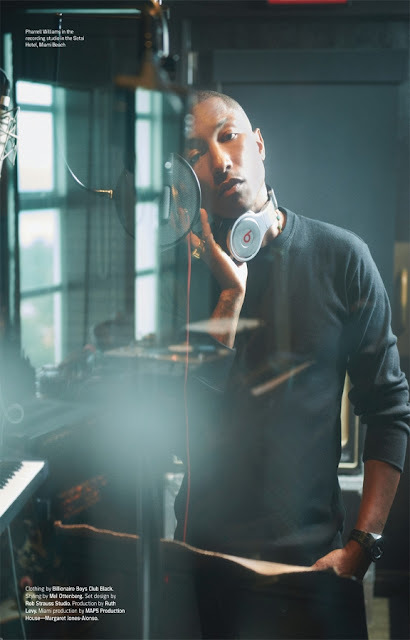 Daft Punk's Thomas Bangalter on Pharrell: "Pharrell's an extraordinary, multitalented artist—songwriter, singer, rapper, producer. He's a great collaborator, because he has a deep knowledge of all these different roles and what it takes to make a great song. As a singer, he'll know how to interact with a producer, and likewise, as a producer, he'll know how to interact and work with singers. He was always really the only choice in our mind for 'Get Lucky.' We've known him for a long time, and we've always considered him as this genuine, timeless entertainer, glamorous and elegant. It's precisely this timeless elegance that we ultimately wanted to capture on the record. We were totally in sync—we were just on the same wavelength all along the ride.